Some basic information and list some common terms relating to rocks, mierals and crystals . 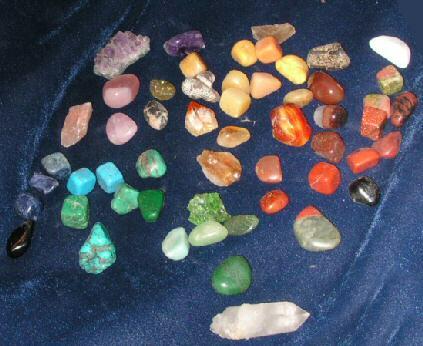 Our main focus here is on the mystical spirits and healing energy of crystals. A little bit of the more mundane information can give us guidance . Include Granite, rhyolite, obsidian, and basalt among others. Igneous rocks are formed by the solidification of molten magma that emerges via volcanic activity and emerges or erupts through vents or fissures in the Earth's Crust The nature and properties of these crystals vary greatly depending in part on the conditions under which the magma solidified . fast cooling creates rocks that tend not to have crystals slower cooling can give similar kinds of atoms trapped in the magma time to find each other and form crystals . There are thousands of different kinds of igneous rocks. Rocks such as limestone , sandstone, shales, halites coals, and gypsum are formed by the accumulation of "sediments" these are fine rock particles or fragments, skeletons of microscopic organisms or minerals leached from rocks that have accumulated from weathering. These sediments have been redeposited under water and were later compressed in layers over time and are classed as either evaporative (often water soluble ) or organic sedimentary rocks. Rocks such as marble, slate , schist, gneiss and quartzite are formed by the alteration of igneous and sedimentary rocks through heat and/or pressure. These physical and/or chemical changes to rocks maybe exemplified by the formation of marble from thermal changes that have occurred to limestone. A mineral is defined as a substance that must have all four of these characteristics: It must be found in nature. It must not be made of anything that has ever been alive (organic). It has the same chemical makeup wherever it is found and its atoms are arranged in regular patterns and form crystals. It is solid. Rocks are sometimes defined as an aggregate or combination of one or more minerals and the definition is extended to cover clay ,loose sand and certain limestones. a crystal is a uniform body with a geometric lattice. the varying structures of the lattice are the causes of the varying physical properties of the crystals and therefore also of the minerals and gems. Piezoelectricity is that quality by which electricity and sometimes light is produced by compression . Many cultures and spiritual traditions have used crystals in ritual, often striking them to produce flashes of visible light. Pyroelectricity is that quality of an electrified state or polarity which is produced by variation in temperature. Quartz has both piezoelectric and pyroelectric properties which means that the polarity of quartz crystal will change when subject to pressure or heat as well as when held. light reflected by a series of microscopic canals. Bands of light and dark that vary in width and hue as the stone is turned in the light. surface. This happens when there are layers of weakness within the crystal. Composed not of a single crystal crystal but of many extremely small crystals, fused together. The way different colors or shades can be seen according to the angle at which you look at the crystal. Light is split into two rays, producing a double image. Any embedded foreign body, such as rutile crystals in Quartz, or an ant in Amber. The colorful play of refracted light reflected from cleavage planes. Refracted light is bent so as to enlarge, reduce, invert, or otherwise distort an image. One way gemstones are classified is by hardness, both scratch hardness and cutting resistance while the Mohs scale of hardness developed by Frederich Mohs (1773-1839) is made somewhat obsolete by modern technology an idea of the general hardness of a stone and whether it is brittle helps you to protect your stones from damage and can help with identification from softest to hardest the Mohs scale. The Mohs Scale of Hardness has 10 classifications, 1 is the softest, and 10 is the hardest. The only mineral that is an exception to this is mercury, which is liquid. The diamond is the hardest, rated 10. Your fingernail is a 2, a pocket knife is about a 5-6, and a piece ofglass is a 6-7.Each classification will scratch the one preceding it. 4. Fluorite, Malachite, Platinum: Can be scratched with a knife and any stone rated 5+. Will scratch any stone rated 3-. 6. Feldspar, Pyrite, Amazonite, Hematite: Can be scratched with a knife and any stone rated 7+. Will scratch any stone rated 5-. 7. Quartz, Tourmaline: Will scratch glass and any stone rated 6-. Can be scratched by stones 8+. 8. Topaz, Spinel: Will scratch glass and any stone rated 7-. Can be scratched by stones 9-10. 9. Corundum (ruby, sapphire): Will scratch glass and any stone rated 8-. Can be scratched by diamond. The terminology for the rocks and crystals which is really informative and researchable details. Thank you.